During the eighth century AD Suraj Sen, the chieftain of the place was struck by a misterious deadly disease and was cured by the saint Gwalipa. As a tribute the chieftain had named the place after the saint, hence the place had come to be known as Gwalior. Many dynasties had ruled the place, each one of them leaving behind their stamp, memories and monuments of their rule. The city is centered around the fortress, one of the most formidable in India, built on the top of the isolated rock measuring about two and half KM in length, about a KM in width, and with a maximum height of 100 M. The present city could broadly be divided into three, namely Morar, Lashkar (Lashkar in Persian leanague means army or camp) and Old city. Morar, formerly a separate town, lies three miles east of the old city. This former British military cantonment had been restored to the Sindhias during 1886 after troops at Morar were withdrawn to Jhansi. In the Revolt of 1857 Morar was the scene of the most serious uprising in Central India. Lashkar is derived from the Persian lashkar, meaning army, or camp, as it was originally the camp, and later the permanent capital, of Sindhia at Gwalior. Jivaji Chowk is the central focus of Lashkar. The old city of Gwalior is of considerable size, lies at the eastern base of the rock. The tomb of Mian Tansen, a great singer and one of the 'Nine Jewels' of Akbar's court is situated here. Close to the heart of the city is splendid Jai Vilas Palace, patterned on the French palace of Versailles. The Scindia Dynasty hails from Kanherkheda, near Satara, in present day Maharashtra. Members of the family joined the Maratha forces under the Chhatrapati Maharajas Shivaji the Great, Shambhaji and Rajaram, serving with valour and distinction in several battles. The family reached the first ranks of the Maratha hierarchy under Ranoji Scindia, a gifted military commander under whose leadership Malwa was conquered. The great fortress of Gwalior, the notorious prison of the Mughals, fell to his forces for the first time in 1738. Ranoji Scindia established his capital at Ujjain in 1731; which remained their capital till 1810. His successor Mahadji Rao Scindia seized Gwalior from the Raja of Gohad in 1765. His successor Daulat Rao Scindia moved the Sindhia capital to Lashkar in Gwalior during 1810. The Sindhia state of Gwalior became a major regional power in the latter half of the eighteenth century; they figured prominently in the three Anglo-Maratha Wars, held sway over many of the Rajput states, and conquered the state of Ajmer. After the defeat of the allied Maratha states by the British in the Third Anglo- Maratha War of 1818, the Scindia were forced to accept local autonomy as a princely state within British India and to give up Ajmer to the British. The Scindia family ruled Gwalior until India's independence from the United Kingdom in 1947, when the Maharaja Jiyajirao Scindia acceded to the Government of India. Gwalior was merged with a number of other princely states to become the new Indian state of Madhya Bharat. The rich royal remains of this dynasty are still spreading its fregnence in the city of Gwalior. The Scindias with Maratha background and followers of Chhatrapati Maharajas Shivaji the Great, have also brought with them the rich tradition of worshiping of Lord Maruti (Hanuman) as was done by the Guru Samart Ramdas, the Guru of Chhatrapati Maharajas Shivaji the Great. Jai Vilas Palace is the royal seat of the Scindia family. Even now the portion of the palace is serving as the residence of the Scindias. The splendid Jai Vilas Palace, patterned on the French palace of Versailles, is located at the heart of the city. No tourist to the city could afford missing the visit this place. The palace complex has three entrances, as you move from west to east on the road leading to moti mahal you will come across these three gates leading to the Jai Vilas Palace. The first one which is just opposite to Jiwaji club of badminton (which was called as 'gend-ghar' during state period) will lead you to the museum maintained by the erstwhile royal family. If you proceed further on the road which leads you to Moti Mahal which houses presently many Government departments, the second entrance to the palace known by the name 'Rani Mahal dwar' could be seen. The present Scindia family enters to the Jai Vilas Palace using this entrance. On further down is the 'main entrance' which was used in olden days, but presently used only occasionally. Just opposite to this artistically made main gate, is located the temple for Lord Maruti, adjacent to the park, which use to be cricket ground during State period. The original temple for Lord Maruti had been established during Sri Mahadji Rao Scindia's time some where near 1779 and further strengthened during Sri Daulat Rao Scindia's period. The main deity of Lord Maruti had been installed by His Holiness Param Braham Maha Rudhr Sat Guru Sri Sri Dev Nathji of Devnath Mutt, Surji Anjan Goan, Amaravati District, Maharashtra. The prana pradhista of the Lord Maruti was done by this holy saint. It is the tradition of the Scindias to take the blessings of the Lord Maruti, before venturing out for the days routine. Hence this Maruti mandir had been built just opposite to the main entrance of the Jai Vilas Palace. Today though the Scindias do not visit this temple everyday, but the tradition of visiting this temple by the royals are still in practice. After the death of Sri Madhav Rao Scindia his son Sri Jothiraditya Scindia had performed the religious rites for his father and after the thirteenth day ceremony, the first 'sub karya' he had done was to visit this temple on 12th of October 2001 and take the blessings of the Lord Sankata Mochan Hanuman. This temple for Lord Maruti had been established by the Scindia dynasty is south facing. As you enter the temple complex on to the left (west) is the main temple. 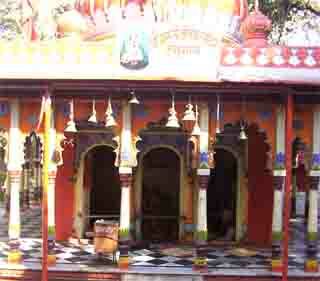 The temple of Lord Maruti is south facing and just opposite to this main mandir is the for Lord Ram. These two mandirs are separated by a big 'angan', where the devotees can sit and meditate. The mandir of Lord Ram is north facing and the sannathi of Lord Ram, Janaki and Luxman is facing Lord Maruti. On the two sides of the Lord Ram's sannathi is sannadhi for Lord Krishna, Radha and Lord Vishnu, Laxmi. There are two separate sannathis for Lord Ganesha and Devi Kali. All these are latter addition to the main Maruti mandir. The Lord Sri Sankata Mochan Hanuman installed by His Holiness Param Braham Maha Rudhr Sat Guru Sri Sri Dev Nathji is not a sculptured one but curved by the nature (swayambhuhu). The Lord here is south facing and a 'yathur muki' Hanuman blessing His devotees with 'poorna drishti'. The Lord's right hand is seen in 'abhya mudra' and His left hand is resting in His hips. There is Lord Shiva in linga roopa since the Lord Maruti is a 'Rudhra-avathara'. Next time when you are around Gwalior do not miss to have dharshan of this all powerful Rudhra-avathara Sri Sankata Mochana Hanuman of the Maruti Mandir near Jai Vilas Palace and bring with you the esteem and confidence for your endeavors and life.